Adel al-Jubeir, the minister of state for foreign affairs, called Iran a "chief sponsor of terrorism," saying its allegations sought to divert the attention of the Iranian people from the country's own troubles. RIYADH, Saudi Arabia (AP) — Saudi Arabia's unprecedented anti-corruption sweep that saw top princes, businessmen, military officers and officials detained at the Ritz-Carlton hotel has concluded after netting the government around $106.6 billion, the Royal Court said Wednesday. 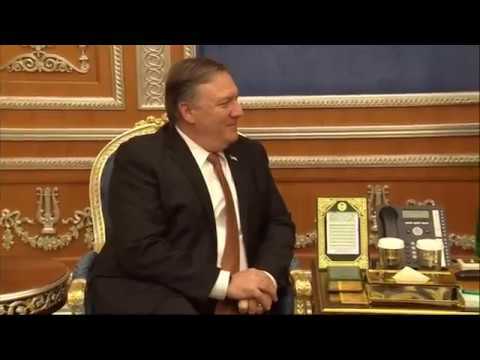 RIYADH, Saudi Arabia (AP) — U.S. Secretary of State Mike Pompeo said he told the king and crown prince of Saudi Arabia on Monday that the Trump administration expects the kingdom to hold accountable "every single person" responsible for the slaying of journalist Jamal Khashoggi, who was killed inside one of the country's consulates after writing columns critical of the government. RIYADH, Saudi Arabia (AP) — U.S. Secretary of State Mike Pompeo said Monday that President Donald Trump's threat to devastate NATO ally Turkey's economy if it attacks U.S.-backed Kurdish fighters in Syria underscores America's commitment to its partners. RIYADH, Saudi Arabia (AP) — Women, some without headscarves, drove themselves to a Formula-E car race where thousands of young Saudis and hundreds of international visitors partied into the night at concerts by Enrique Iglesias, The Black Eyed Peas and DJ David Guetta. CAIRO (AP) — Egypt on Tuesday put on a show of support for Crown Prince Mohammed bin Salman, doing its part as an ally and recipient of Riyadh's largesse to help the young royal weather the international outrage he faces over the killing and dismembering of Saudi journalist Jamal Khashoggi. Egypt's president and Saudi Arabia's crown prince have held talks in Cairo, the latest stop on Mohammed bin Salman's first foreign tour since the killing of Saudi journalist Jamal Khashoggi. RIYADH, Saudi Arabia (AP) — Saudi Arabia's King Salman received Iraq's president in Riyadh on Sunday, a day after the Iraqi official visited the kingdom's rival, Iran. Barham Salih's back-to-back visits to Iran and Saudi Arabia reflect the delicate balance Iraq seeks to maintain in a region where its two powerful neighbors are battling for supremacy. WASHINGTON (AP) — President Donald Trump said Saturday that his administration will release a full report in the next two days about the death of a Saudi journalist, which has created a diplomatic conundrum for the president: How to admonish Riyadh for the killing yet maintain strong ties with a close ally in the Middle East. "We'll be having a very full report over the next two days, probably Monday or Tuesday," Trump said. That will include "who did it," he said. WASHINGTON (AP) — A retired four-star general is President Donald Trump's pick to be U.S. ambassador to Saudi Arabia, filling a key diplomatic vacancy at a time when U.S.-Saudi relations are being tested by the slaying of a journalist critical of the Saudi royal family. CAIRO (AP) — A minister who served in Yemen's rebel government before defecting to Saudi Arabia was struck by a shoe hurled by a Yemeni journalist at a news conference in Riyadh. Abdul-Salam Ali Gaber, who served as information minister, is the most senior member of the Houthi administration to defect since civil war broke out in 2014. He made his first public appearance during Sunday's news conference. That's a nondescript way to describe a spectacle — headlined by major stars including The Undertaker and Brock Lesnar — that WWE would usually blitz fans with bombastic hype to promote. CAIRO (AP) — Saudi Arabia's financial clout among the Arab media has given it an influential tool as it grapples with the international outcry over the death of Saudi writer and dissident Jamal Khashoggi. Turkish media have published a security camera image allegedly showing a vehicle belonging to the Saudi Consulate "scouting" a forest in the outskirts of Istanbul before the killing of Saudi journalist Jamal Khashoggi. The image obtained by state television TRT and other media on Wednesday shows a black car with a diplomatic license plate at an entrance to Belgrade Forest. ISLAMABAD (AP) — Prime Minister Imran Khan's decision to attend a Riyadh investment conference despite the outcry over the killing of a Saudi journalist has coincided with an agreement for a $6 billion assistance package from the oil-rich kingdom, a crucial infusion of cash as Pakistan grapples with a soaring deficit. Analysts say the Saudi infusion will allow Islamabad to breathe a little easier as it seeks a critical loan from the International Monetary Fund to address its $18 billion deficit. RIYADH, Saudi Arabia (AP) — A high-profile investment conference opened in Saudi Arabia on Tuesday, providing an early indication of Crown Prince Mohammed bin Salman's shifting fortunes after the killing of Saudi writer Jamal Khashoggi. ISTANBUL (AP) — Just hours after writer Jamal Khashoggi was killed in the Saudi Consulate in Istanbul, a man strolled out of the diplomatic post apparently wearing the columnist's clothes as part of a macabre deception to sow confusion over his fate, according to surveillance video leaked Monday. BERLIN (AP) — A top German official pressed Monday for the European Union to show a united front on arms exports to Saudi Arabia after Berlin backed a freeze on such exports over the killing of writer Jamal Khashoggi. CAIRO (AP) — Sudan's state news agency is reporting that former field marshal and president of Sudan, Abdelrahman Swar al-Dahab, who seized power in a military coup but passed leadership over to civilians in 1986 after a year in power, has died at the age of 83. SUNA said he died on Thursday, while Saudi channel Al Arabiya reported that he died in Riyadh, Saudi Arabia. Neither immediately gave any further information on al-Dahab, who was the fifth president of Sudan. LONDON (AP) — The kingdom of Saudi Arabia has enjoyed the ultimate protected status from the United States throughout its short history.